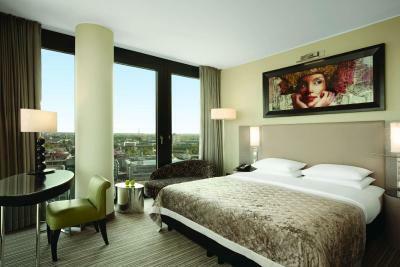 Lock in a great price for Hyatt Regency Düsseldorf – rated 8.8 by recent guests! Awesome place to stay for travel alone or with a companion. It is located right on the river walk, sparkling clean facilities and very freindly and professional staff. The staff were welcoming and friendly, we liked the view of the room and also the walk to the old town. The design of the hotel , the parking is safe and there is a direct elevator from the parking to the hotel. 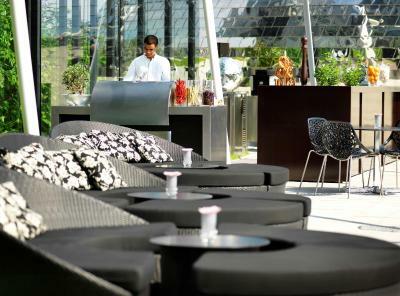 Parking, Nice Room, quit location, nice view, Modern and Nice Design , Fast check in and check out. I felt at home. All facilities were up to my expectations. We booked the room with a view, and it certainly gave value for money. Great view over the mediaharbour and the radio tower. We enjoyed the breakfast a lot, managed to stay there for 2h!! Location, cleanliness, comfortability of the room, facilities at the room, view of the room, air conditioning, friendly staff, unique atmosphere and mood. Location. Room size, design and comfort + view. I would definitely come back to this hotel. Dedicated Team overall. Looking forward to my next stay there. 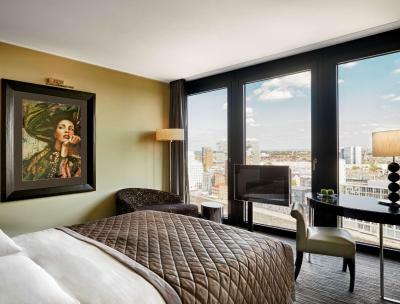 Hyatt Regency Düsseldorf This rating is a reflection of how the property compares to the industry standard when it comes to price, facilities and services available. It's based on a self-evaluation by the property. Use this rating to help choose your stay! 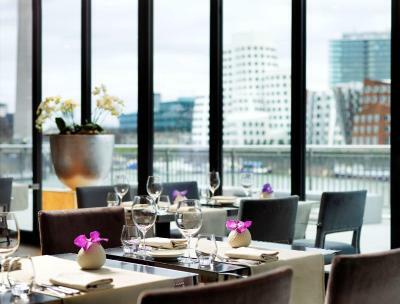 One of our top picks in Düsseldorf.This luxurious hotel is located in Düsseldorf’s lively MedienHafen district, directly on the River Rhine. 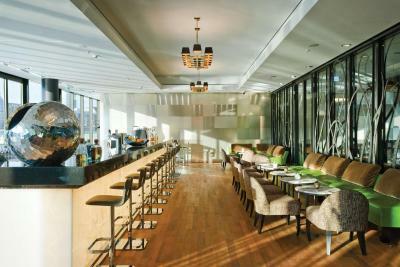 It offers panoramic harbor views, free WiFi, modern spa facilities, and international gourmet cuisine. 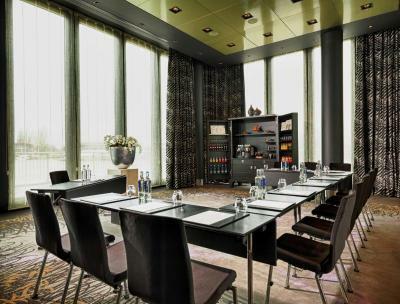 All nonsmoking rooms at the Hyatt Regency Hotel Düsseldorf feature a flat-screen TV, laptop safe, and tea/coffee facilities. Some also enjoy a view of the River Rhine and Düsseldorf Harbor. 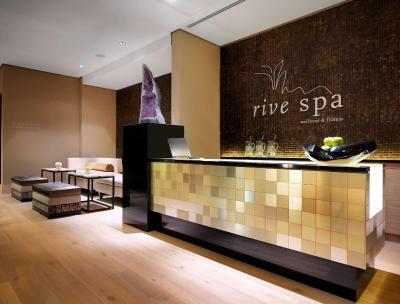 Guests at the Hyatt Regency are welcome to relax in the Rive Spa with sauna, hot tub, and treatment center. 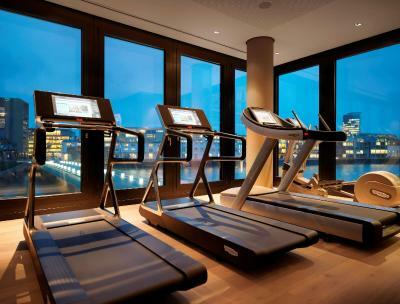 The gym invites guests to keep fit. The Düsseldorf Opera House is less than 3.1 mi from the Hyatt Düsseldorf. 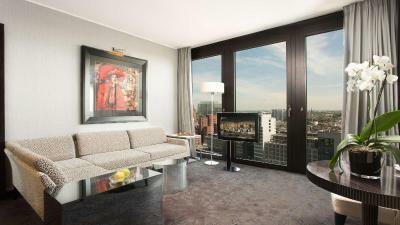 The Hyatt is a 15-minute drive from the Messe Düsseldorf Exhibition Center and a 25-minute drive from Düsseldorf Airport. 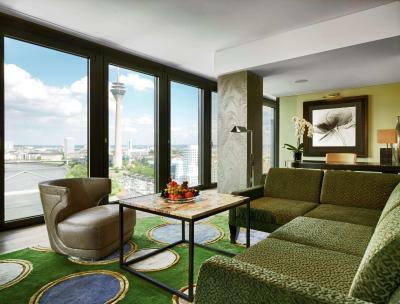 The hotel offers a complimentary shuttle to Düsseldorf city center on Fridays and Saturdays. 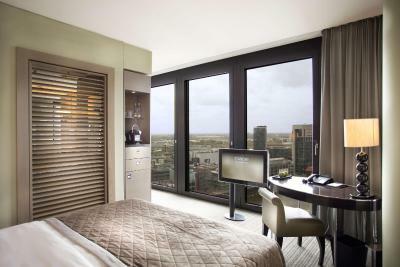 When would you like to stay at Hyatt Regency Düsseldorf? 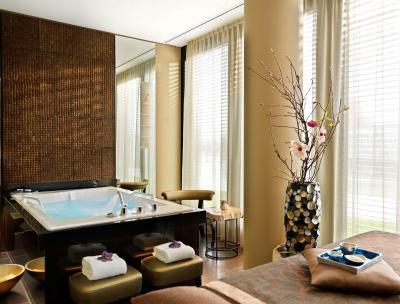 This room includes panoramic views of the skyline, a walk-in shower, a bathtub and granite details. 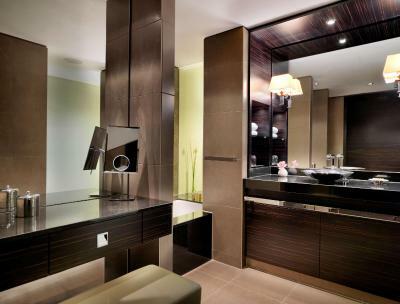 This room features a view of the Media Harbor, a desk, a level-access shower, a bathtub and granite details. This twin room has a view of the Media Harbor, a walk-in shower, a bathtub and granite details. 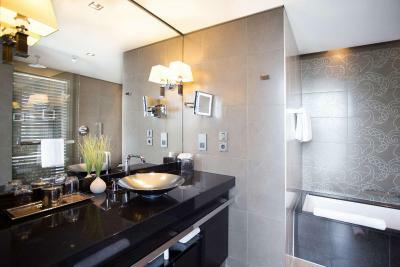 This room features a view of the Rhine Tower, a walk-in rain shower, a bathtub and granite details. 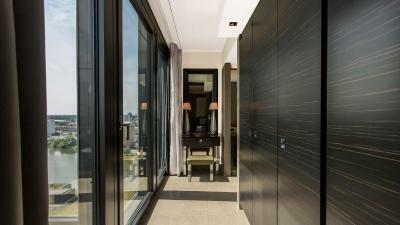 This double room is located on the 17th and 18th floors and features a rain shower, a bathtub and granite details. Relax in this spacious room with contemporary design furnished in warm earth tones and with natural fabrics. Featuring a work area, walk-in rain shower and bathtub. This suite features a separate living room and bedroom, partial views of the Media Harbor, a level-access rain shower, a bathtub and granite details. 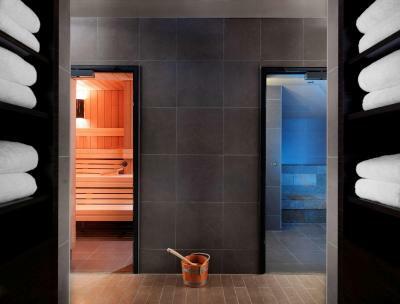 This room features a level-access rain shower and bathtub. 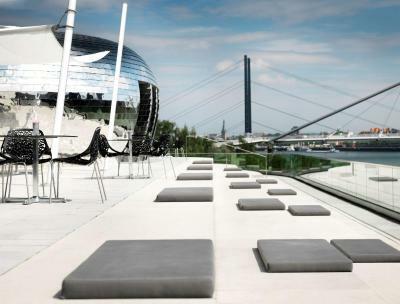 Hyatt Regency Dusseldorf is a modern design hotel located in the Media Harbour. 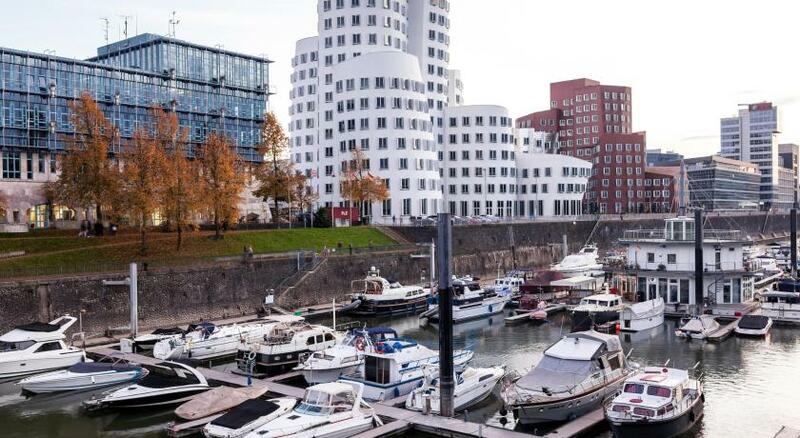 Our hotel in Dusseldorf is located in one of two 19-storey buildings at the tip of a peninsula directly on the Rhine River with a stunning view of the Old Town, the Rhine Tower and the skyline of Dusseldorf. The exclusive hotel offers 303 elegant guestrooms and suites with ceiling-high windows and complimentary WiFi, DOX restaurant with international cuisine and sushi, DOX bar and self-service restaurant Café D. In addition, Hyatt Regency Dusseldorf provides 850 square metres of function space and is home to Rive Spa & Fitness, which features five treatment rooms as well as a whirlpool and two saunas on 485 square metres. Hotel surroundings – This neighborhood is a great choice for travelers interested in clothes shopping, luxury brand shopping and bars – Check location Excellent location – show map Guests loved walking around the neighborhood! 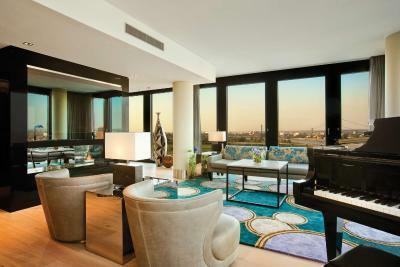 House Rules Hyatt Regency Düsseldorf takes special requests – add in the next step! 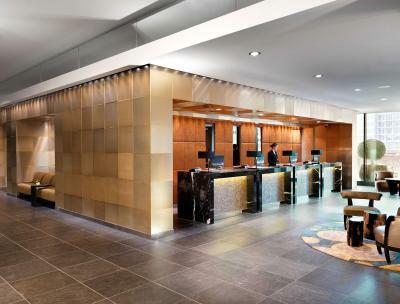 Hyatt Regency Düsseldorf accepts these cards and reserves the right to temporarily hold an amount prior to arrival. Breakfast was fantastic. Excellent variety. Staff member Mohammed was most helpful throughout our stay. Lovely quite "lounge bar" near the restaurant. There was nowhere to comfortably and safely bath the baby. And the baby bed had no mattress so I had to keep her in bed with me. The complimentary baby products (shampoo, nappies, etc.) were a lovely touch. 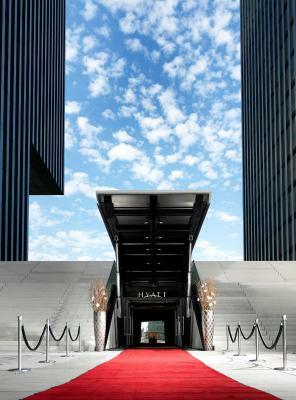 The valet service and being able to drive right to the door was really convenient. It was 100% accessible with a stroller which was superb for a parent travelling alone with baby. The insulation was fabulous and you couldn’t hear other guests at all. Hotel, room, breakfast everything is great. Price to high for the service , staff with snob attitude , concierge not organizer at all...……….for 5 starts and price need to be perfect and more professional. >>DEAR VISITORS BE CAREFUL<< READ THIS CATEREFULLY ITS NOT 5 STARS HOTEL The service is extremely Awful. For example if u want to request toothbrush. U need to call at least 4 times u till they get it to u. And when u complaint to front desk staff they say its Normal , and they say also its not our job the housekeeping diddnt get u the things we are not responsible. U feel like there is war between house keeping department and front desk. There is no communication between them. I requested a bottle of water yesterday five times,and waited like 3 and half hours to get it. I also requested a pillow for like 6 times and they get it in 2 hours, i requested sanitary bags two days ago,i checked out the hotel and still didnt get it. I Think Hyatt regency should downgrade to 2 stats hotel not even 3 stars. The only good staff is the concierge guy.